Provide comfort for the family of Gertrude Dowalo with a meaningful gesture of sympathy. 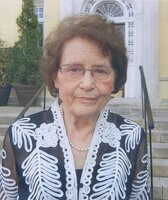 Gertrude Dowalo, 91 of Manalapan, NJ passed away on Thursday, December 20, 2018 at Robert Wood Johnson Medical Center. She was born in Donora, PA and resided in Manalapan since 1986. Gertrude was a communicant of St. Thomas Moore Roman Catholic Church. Mrs. Dowalo was preceded in death by her parents John and Agnes Jozerczyk; her husband Joseph R. Dowalo; siblings, Joseph, Josephine, Julia, Edward, Jennie, William and Stan. She is survived by her daughter, Jane and her husband Carl, daughter Patricia and her husband Marty, her son, Charles and his wife Joanne and 2 grandchildren, John and Anthony. Family and friends are invited to gather at the Freeman Funeral Home, 344 Route 9 North, Manalapan, from 2 to 6 p.m. on Sunday, December 23, 2018. A Funeral Liturgy will be held Monday, December 24, 2018 at 10 a.m. in St. Thomas Moore Roman Catholic Church. Interment will be held on Thursday, December 27, 2018 at 10 a.m. in the Monongahela Cemetery, Monongahela PA. Arrangements were entrusted to the ANTHONY L. MASSAFRA FUNERAL HOME AND CREMATION SERVICE INC., 40 Second St. Ext., Carroll Township/Donora PA 15033, (724) 379-6900. To send flowers in memory of Gertrude Dowalo (Jozerczyk), please visit our Heartfelt Sympathies Store. Provide comfort for the family of Gertrude Dowalo (Jozerczyk) by sending flowers.